Making satisfying, nutritionally-balanced meals for you and your family is a big challenge that can add a lot of stress to an already busy workweek. This holiday season, make the mad dash to dinner easier on yourself and save money by planning scrumptious meals in advance with the Season's Eatings holiday recipe book from Divine Eats. Gathering around the table to feast on foul is a time-honored tradition in many households. A turkey is big enough to fill multiple tummies and an entire home with a savory aroma. Find your ideal turkey recipe in Season's Eatings, as well as more palate-pleasing entries that will delight your guests. In addition to the recipes you need for brussels sprouts, mashed potatoes, and cranberry sauce, this recipe book has the secrets to making delectable desserts and serving joyful libations. Planning your meals in advance will save you money, as you can make a grocery list and stick to it. By avoiding processed foods, you'll avoid paying for brand name foods and assure that your family's diet is healthier and cleaner. 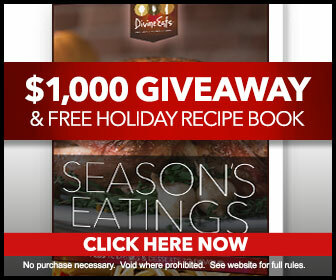 Get your free Season's Eatings recipe book from Divine Eats, where "free never tasted so good." As an added bonus, downloading your free recipes will gain you automatic entry into a draw for $1,000. Contest ends December 31st, 2016.